In our last post, we discussed the intelligence lesson to be learned by Hitler’s choice to invade the Soviet Union in Operation Barbarossa. On the other side, the Soviet Union’s reaction to that invasion provides us with one of history’s most glaring examples of bad intelligence assessments. Intelligence professionals that read this series should be aware that I use the term “assessment” in the generic English sense rather than in the technical professional sense. All intelligence agencies have their own requirements and rules for what an “intelligence assessment” should look like. We are not following any of those requirements other than the ones that coincide with the researching and writing of history. To understand the Soviet Union’s failure to adequately prepare for the German invasion of June 22, 1941, it’s important to consider the decision making process of the Soviet Union. 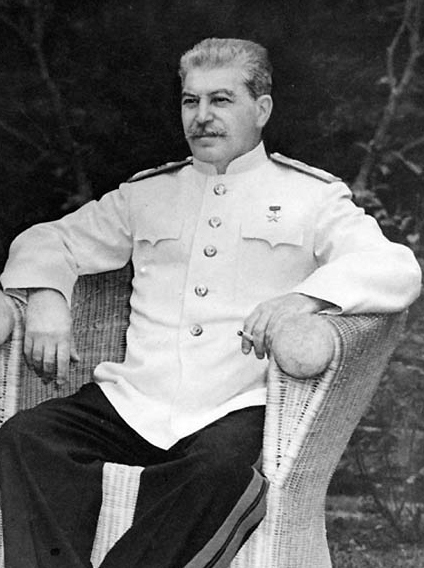 Josef Stalin was a dictator that only nominally reported to the Communist Party of the USSR. In reality, the Communist Party lacked the will or practical authority to oppose any decisions taken by Stalin. By 1941, everyone in the USSR understood that disagreeing with Stalin about anything was likely to lead to arrest, torture, and possible execution. Not surprisingly, Stalin had grown accustomed to people agreeing with him. While he may have enjoyed his success in bending the entire USSR to his will, it had an isolating effect that would prove disastrous. 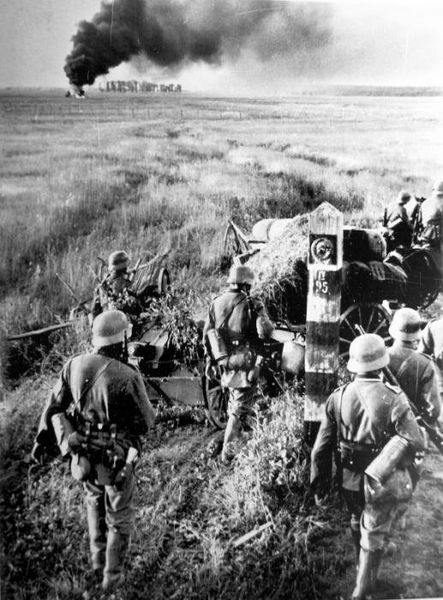 Even though Hitler vastly underestimated the war fighting capability of the USSR, he understood that the USSR had a much larger military than did Poland or France. Accordingly, he instructed the German military to move approximately 3.8 million troops into position to invade the USSR. Some of those troops were not for employment in the spearheads of the invasion, and, therefore, did not need to be kept close to the Soviet borders. Still, even in the pre-satellite age, it was difficult to disguise German troop buildups. The six lines of attack comprising Operation Barbarossa on June 22, 1941. From The Battle of Russia, the fifth film in the Why We Fight series by US Govt. So how did Stalin manage to ignore the massive German buildup leading to Operation Barbarossa? 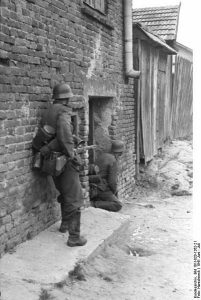 There are various opinions about the details of how and why Stalin failed to anticipate a German invasion, but some aspects are nearly universally accepted. One might assume that the Soviet NKVD (the precursor to the KGB) and military intelligence forces were inadequate or perhaps nearly blind to all evidence. This was clearly not the case. The Soviet Union leadership considered itself to be in a perpetual state of war with the rest of the world. From their point of view, the character and intensity of that war varied, but there was no such thing as real “peace” with Western nations. The Soviet State also operated on the assumption that it was and would always be in a state of war with a significant portion of its own citizens. These two fundamental assumptions caused the USSR to invest heavily in intelligence efforts. Both the NKVD and Soviet military intelligence accurately assessed that Hitler was planning an invasion of the USSR. They had done an excellent job of penetrating Hitler’s Foreign Office, intelligence services, military staffs, and industry. They were receiving more than enough information from a variety of independent sources to be certain that Operation Barbarossa was imminent. In addition to its direct sources in Germany, Stalin’s intelligence community was aware of US and UK assessments of Hitler’s intentions. When diplomats from the US and the UK informed Stalin of German plans to invade the USSR, Stalin had already heard this from his spies in the UK and the US. He assumed that all the warnings coming from the Western nations were part of a Western conspiracy to force him to go to war with Hitler prematurely. Stalin preferred to let the West demolish itself, and he planned to step into a convenient power vacuum of a destroyed Western Europe. Opinions vary about precisely how, in the face of so much corroborative information, Stalin failed to anticipate the German invasion. In one sense, he didn’t. Just as Hitler understood that carving up Poland with the USSR would in no way appease Stalin’s long term goal of annihilating Western nations and governments, Stalin clearly understood that Germany would try to attack the USSR. Stalin’s basic reaction to that reality was to attempt to outsmart the Western nations. Remember, from Stalin’s point of view, the UK, France, and other Western enemies were as much a threat to the Soviet system and Soviet ambitions as was Germany. All Westerners were Stalin’s enemies, and all of them needed to be accounted for in the Soviet geopolitical calculus of the day. In addition to considering the threat from his Western neighbors, Stalin had to consider the very real threat of invasion by the Japanese military to the east. Japan had already conquered vast swaths of China, and it could not be completely ignored. Stalin responded to the threats that surrounded him by using his vast NKVD resources to try to maneuver Western countries into war with themselves and by counting on the Japanese to continue being strategically diverted with their slaughter of the Chinese. From Stalin’s point of view, Hitler’s invasion of his Western neighbors perfectly fit into his plans. Stalin never doubted that Hitler would invade the USSR, but since Germany was still busy dealing with the undefeated UK, he was certain that Hitler would not make the mistake of throwing Germany into the same sort of two-front war that brought that country to ruin in 1918. When Stalin’s magnificent intelligence services explained to him that Hitler was not going to wait for the fall of the UK to invade the USSR, his megalomaniacal personality enabled him to ignore them. When anyone in his intelligence, diplomatic, or military organizations foolishly attempted to argue the point with him, he accused them of being enemy agents and had them murdered or banished to labor camps. Since June 22, 1941, Stalin’s miserable intelligence assessment of German intentions has been a popular topic of study. As more files have been obtained from the now defunct USSR, more explanations are offered as to precisely how Stalin managed to deceive himself. 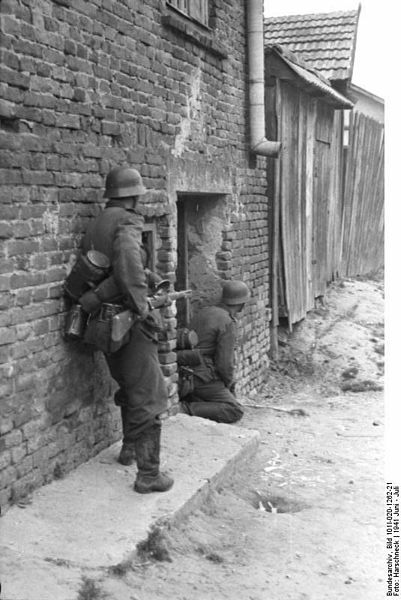 Image from German Federal Archives, wikimedia commons. Thus far, the various theories and occasional new evidence have not changed the essential facts of the case. Stalin failed to prepare for Operation Barbarossa because he refused to acknowledge that anyone might understand the strategic situation as well as or better than he could. The results of his grand miscalculation were devastating for the USSR. We cannot assume that the best possible preparations by the USSR would have completely and bloodlessly defeated the German invasion, but it is reasonable to assume that the USSR would have suffered far fewer casualties in halting the German advances. There is one other “what if” that we usually ignore when examining Stalin’s grotesque mismanagement of the Soviet military machine. If indeed Stalin had been able to defeat Hitler’s invasion more efficiently, then Soviet forces likely would have advanced further west before the Allied Forces reached the same positions. Then the post-war division of European nations might have left even more European nations enslaved by Soviet occupation. Stalin’s horrendous failure to anticipate Operation Barbarossa reinforces the lesson that even the best intelligence is only useful when leaders use it effectively. Stalin’s failure in 1941 also demonstrates another important lesson from Intelligence history . . .
Nations and their leaders should be aware that their own plans and ambitions can blind them to their enemies’ intentions. In our next segment we will consider an oft-ignored intelligence wild card in Operation Barbarossa. I’ve also read that one of Neville Chamberlain’s failings was surrounding himself with yes-men, albeit in a non-dictatorial way Hitler and Stalin did. The net result though, was similar: Failure to anticipate Hitler’s real intentions after “Peace In Our Time” Munich. Hi Ted. Is the tank in your avatar your personal vehicle? I can understand you using one for driving in DC. Chamberlain begged mentioning in this series. I promise I will not ignore his case. The armored vehicle in my picture is a static display of a Canadian Sherman Tank. It was taken in front of the Beatty St. Drill Hall, home of the British Columbia Regiment (Duke of Connaught’s Own). I was in Vancouver, BC, with my second ex-wife to view some skating events for the 2010 Winter Olympic Games. Excellent post! Highlights a point perhaps forgotten – the Second World War wasn’t ‘good vs evil’, it was actually ‘good, briefly allied with evil, vs evil’. The world of the 1930s was a triumvirate; the western democracies set against two dismally nasty flavours of totalitarian dictatorship – Nazi and Soviet. I don’t think Stalin was any less evil than Hitler, and like Hitler he had the same flaws of isolated, paranoid leadership. Churchill knew it – and was supremely uneasy about dealing with Stalin; but as he said, ‘If Hitler invaded Hell I would make at least a favourable reference to the devil in the House of Commons’. Curiously, I’ve got a book in my collection, by a recent ‘revisionist’ German military historian, attempting to argue that the Soviet military dispositions of early 1941 were geared towards a planned invasion of Europe. It’s not convincing – the logic is inductive – but to me it underscores the actual vacuum of Soviet military planning, which was all personal to Stalin, as you outline. I want a tank like Ted’s. Just the thing for dealing with the dire car-parking shortage in central Wellington (I know what I said). Thanks Matthew. you used one of my favorite Churchill quotes. Thanks for the reminder about Stalin and Hitler. I’m fine with their mutual destruction, incomplete as it was. Has it been a recurring theme though history–a smug strongman surrounding himself with yes-men? I’ve been worried about the turnover in the upper ranks of our own military. Hi Lyn. Yes, dictators have often surrounded themselves with yes-men. In some cases they have simply ignored the advice of the best experts. One current example is Nicolas Maduro of Venezuela. Maduro rose to power by being the biggest yes-man to his predecessor Hugo Chavez. Unfortunately for Venezuela, he is even less intelligent than Hugo was. Maduro does listen to his more intelligent wife, Celia, but she, in turn, ignores Venezuela’s best experts on economics, law, etc. As for our turnover in the US military, some of it has been routine turnover. In the case of the US Navy admirals that will be “retired” over the shameful “Fat Leonard” scandal, I am glad that they will be gone and saddened that they will not be doing hard time in Leavenworth. How Admiral Ted Branch ever became the commander of the Office of Naval Intelligence remains one of the great mysteries of US naval history. Secretary of Defense Chuck Hagel(R) and President Obama(D) erroneously selected Branch to serve as the head of ONI, and the Senate had to approve that promotion. The appointment of the remarkably untalented and apparently corrupt Ted Branch to head ONI was a bipartisan debacle. Fortunately, Branch has been replaced by Admiral Elizabeth Train. Admiral Train is well educated and experienced in intelligence work. She has a long record of high performance and is, in my opinion, both highly intelligent and highly dedicated to her duty. I am confident that Admiral Train is not another pathetic political hack, and that she will re-establish high standards of performance and integrity for ONI.